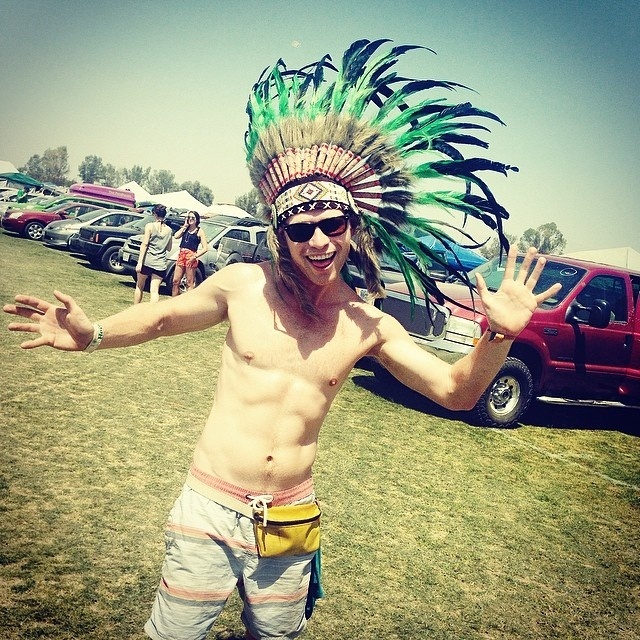 Hipster Headdresses at Coachella: Yep, It HappenedWe're fully aware we risk over-covering the cultural-appropriation idiocy of Coachella, but a pair of ICTMN readers have sent us their snaps fresh from the 2014 festival, which is in its second and final weekend right now, and they're share-worthy. The lingerie model in the massive headdress gearing up for the fest and the high-priced tipis-for-rent danced around the assumption that this phenomenon hasn't gone away, but here's the photographic proof. The Bros of CoachellaAh, the Native American headdress, a staple of the inadvertently racist Coachella bro.Coachella '14: Rent a $2200 Tipi to Match Your Hipster HeaddressAt this year's event, on-site camping includes a tipi (or "tee pee") option; for $2200 you get two general admission passes and a two-person tipi on Lake Eldorado for the weekend. A VIP pass option is also available, for $3100. Ok, Indians are cool. We get it. We actually already knew it. By Zak Cheney-RiceThe news: At this point, the Coachella Valley Music and Arts Festival has inevitably devolved into a parody of itself. Blinding sunshine, massive crowds, exorbitant ticket prices and rampant teenage drug abuse have bolstered its reputation as the yearly paean to rich kid debauchery you love to hate, and the one most people would inexplicably still commit murder to attend. But amidst all the bare skin and disappointed Outkast fans is another issue that bears discussing. It is perhaps best encapsulated by this meme: That genre classic was recently tweeted by Ruth Hopkins, a contributor to the Indian Country Today Media Network. It refers to the ongoing pattern of non-Native Coachella attendees rocking traditional American Indian attire they would never wear elsewhere, like it was a Batman costume or something. Fest Fashion Sans Headdress: How to do Coachella/Native-Inspired Fashion RightWe are kicking off the music festival season, and I want to do all I can to ensure that we do not continue to witness the tacky headdress outbreak that we've experienced in the past several years (just say no to fashion mistakes like Alessandra Ambrosio, left). So, to help out, we've got some non-offensive, super hot, festival-chic Native American fashion options for you music fest lovers out there. These items are made by Native artists and designers, and they are meant to be appreciated by people of all backgrounds, and, the items start at only $22.Comment: For more on the subject, see One Direction Singer in a Headdress and Oklahoma Governor's Daughter in a Headdress.